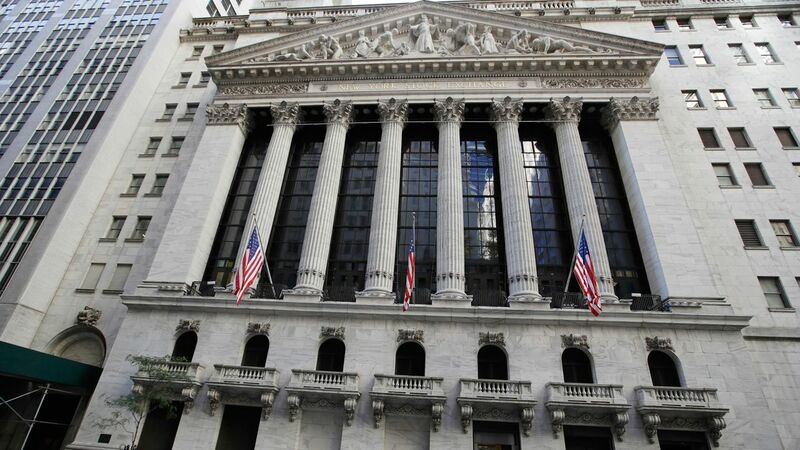 NEW YORK -- The Dow Jones industrial average crossed the 20,000 mark for the first time Wednesday, the latest milestone in a record-setting drive for the stock market. Strong earnings from Boeing and other big companies helped push the Dow past the threshold early on. U.S. stocks closed solidly higher, lifting the Standard & Poor's 500 index and Nasdaq composite to record highs of their own for the second day in a row. Banks and other financial companies led the gainers, which included technology and industrials. Real estate, phone companies and other high-dividend stocks lagged the broader market as bond yields rose. "It's a psychological event to get through that big hurdle, that big round number," said Jeff Kravetz, regional investment strategist at U.S. Bank's Private Client Reserve. "It's really symbolic of what's going on with investor sentiment becoming much more positive, and that's going to drive stock prices higher." The Dow, which tracks 30 major industrial companies, gained 155.80 points, or 0.8 percent, to 20,068.51. The S&P 500 index rose 18.30 points, or 0.8 percent, to 2,298.37. The Nasdaq added 55.38 points, or 1 percent, to 5,656.34. Small-company stocks also rose. The Russell 2000 picked up 13.23 points, or 1 percent, to 1,382.44. The market has been marching steadily higher since bottoming out in March 2009 in the aftermath of the financial crisis. The rally continued after the election of Donald Trump as U.S. president last fall. The Dow first closed above 10,000 on March 29, 1999. Wednesday's rally came against a backdrop of optimism on Wall Street that executive actions and policy goals announced by the Trump administration this week on trade, manufacturing and business deregulation will be good for corporate America. "Whether it's tax reform or infrastructure spending, any of those tend to be optimistic conversations for the markets currently," said Darrell Cronk, president of Wells Fargo Investment Institute. "We have to wait and see how they play out, obviously. The danger here, if there is one, is that the market gets ahead of itself a little bit." Most professional investors are skeptical the Dow at 20,000 will have much effect on the market. They more often look to the S&P 500 index as a benchmark, because they consider it better representation of the broad market. "In and of itself, it is just a number," said Quincy Krosby, market strategist at Prudential Financial. "But what it does is it lifts market expectations, in essence, to continue moving higher." If the Dow reaching 20,000 has any impact, it will likely be a psychological one. Investors have been leery of the stock market for years, unable to stomach the prospect of losing more than 50 percent of their money for a second time if another financial crisis hits. That trepidation has caused them to pull money out of stock funds - even as the Dow made its march toward 20,000 - and depend instead on safer bond investments. Last year, investors pulled a net $27.1 billion out of U.S. stock mutual funds and exchange-traded funds, according to Morningstar. A year earlier, they yanked $66.5 billion. Over the same time, investors plugged a total of $218.6 billion into taxable bond funds. Anyone who resisted the urge to dump their stock investments through all the tumult of the last decade is now seeing the full benefit of a market with the Dow at 20,000. A $10,000 investment in the largest U.S. stock mutual fund made a decade ago, before the Great Recession began, would have dropped below $5,000 by March 2009. But investors who held on even through the worries of another recession hitting, U.S. debt downgrade, the euro crisis and uncertainties over Britain's departure from the European Union would now be sitting on nearly $20,000. This is expected to be the busiest week for corporate earnings news, with about 30 percent of the companies in the S&P 500 reporting quarterly results. Several companies rose on results that exceeded Wall Street's expectations. Boeing was the biggest gainer in the Dow. The aircraft manufacturer climbed $6.81, or 4.2 percent, to $167.36. Seagate's latest quarterly snapshot drove its shares 14 percent higher, to lead all other companies in the S&P 500. The stock added $5.23 to $42.67. Investors also bid up shares in Rockwell Automation, which rose $10.98, or 7.7 percent, to $153.01, and Logitech, which vaulted 15.5 percent. The computer gaming and accessories maker's shares added $3.90 to $29. Some companies posted earnings that failed to impress investors. Textron slumped 5.4 percent after the defense contractor's fourth-quarter revenue missed financial analysts' estimates. The company also announced it is buying snowmobile maker Arctic Cat in a deal valued at about $247 million. Textron was the biggest decliner in the S&P 500, sliding $2.65 to $46.73. Mining company Freeport-McMoRan fell 3.1 percent after it served up quarterly results that missed analysts' forecasts. The stock slid 52 cents to $16.50. Major stock indexes in Europe moved higher. Germany's DAX rose 1.8 percent, while the CAC-40 in France gained 1 percent. The FTSE 100 index of leading British shares rose 0.2 percent. Earlier in Asia, Tokyo's Nikkei 225 surged 1.4 percent after Japan's government said that the nation had a trade surplus in 2016, its first in six years. Hong Kong's Hang Seng rose 0.4 percent. South Korea's Kospi rose 0.1 percent. Energy prices mostly declined. Benchmark U.S. crude fell 43 cents to $52.75 a barrel in New York. Brent crude, used to price international oils, slid 36 cents at $55.08 a barrel in London. Bond prices fell. The 10-year Treasury yield rose to 2.52 percent from 2.47 percent late Tuesday. In currency trading, the dollar fell to 113.60 yen from 113.89 on Tuesday. The euro rose to $1.0743 from $1.0723. Among metals, the price of gold slid $13, or 1.1 percent, to $1,197.80 an ounce. Silver fell 21 cents to $16.98 an ounce. Copper was little changed at $2.71 a pound. In other energy trading, wholesale gasoline fell 5 cents to $1.52 a gallon, while heating oil slid 3 cents to $1.61 a gallon. Natural gas futures rose 5 cents, or 1.6 percent, to $3.33 per 1,000 cubic feet.